Horror is a tricky thing to get right in the realm of interactive experiences. I think it’s because the genre is frequently at odds with the medium. The most successful horror stories plunge you right into the middle of a dire situation, stripping away any sense of control that you might have in a roller coaster ride of frightful imagery and disturbing ideas. Video games, on the other hand, tend to suffer the most when you strip control away from the player. 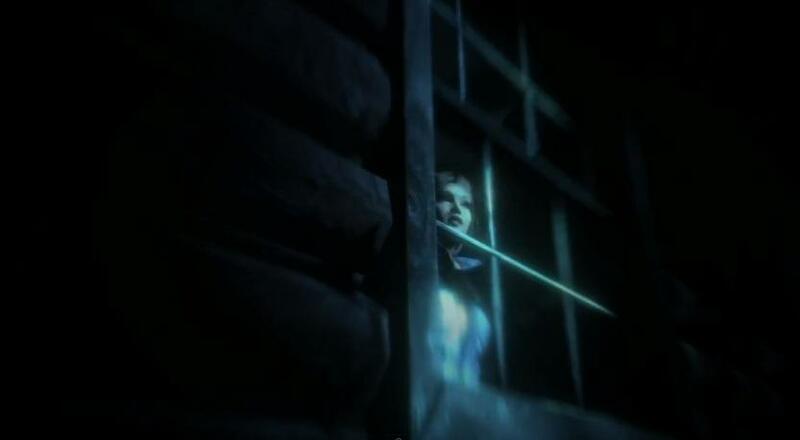 Survival horror builds tension in its own, unique way, limiting players’ access to resources and pitting them against overwhelming odds, but true horror stories are few and far between in the interactive space. Doctor Who: The Eternity Clock developer Supermassive Games has some intriguing ideas for solving this problem, and the dev team is putting those ideas to the test in the upcoming, Sony-published interactive fright flick, Until Dawn. Your first step before reading any further should be to watch the Gamescom reveal trailer, which I think very effectively captures the game’s intent and overall feel. It’s cut exactly like you’d expect a horror movie trailer to be cut, implicitly promising a certain type of experience. The implied tone of Until Dawn appears to be coming together in reality as well, at least based on what I saw during a recent eyes-on preview at a PlayStation media event. 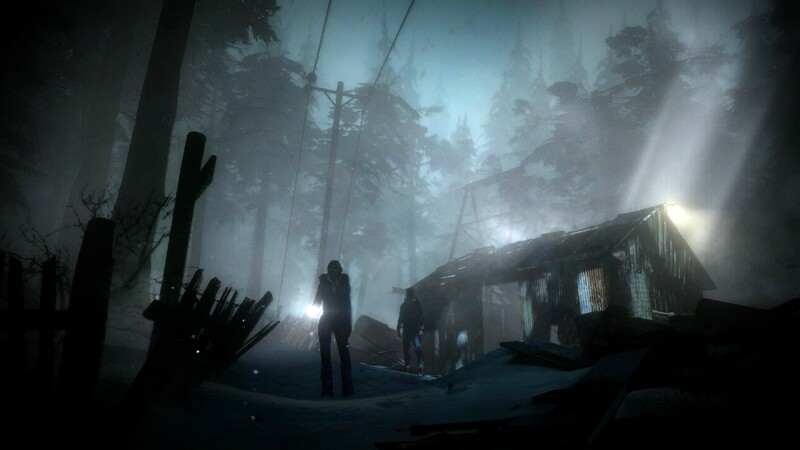 Until Dawn embraces the slasher movie trope of teens being hunted in the woods by a malevolent force. The branching narrative follows a group of eight partygoers who are spending some vacation time living it up at a ski lodge. The trip also happens to fall exactly one year after a similar trip that ended with the disappearance of the current group’s friends. You’d think that such a thing would convince these party animals to stay away, but this is a horror story. You’ve got to expect people to do all the dumb things. Yet Until Dawn isn’t nearly that scripted. The choices that you make and the facts that you discover as you play have a direct effect on who lives and who dies. It’s entirely possible to get through Until Dawn with all eight hearts still beating… or with none of them. The preview I saw didn’t necessarily give me a full sense of these more open-ended elements — largely to preserve spoilers and to keep the experience fresh for one and all — but survival essentially seems to boil down to taking your time and exploring the various environments you’ll visit. Exploration (and all interactions in general) is currently relegated entirely to the PlayStation 3’s Move controller (just the wand). You experience everything from a first-person perspective, and the Move wand doubles as the flashlight that your character holds in his or her hand. You can’t jump between the different characters at will, but you’ll jump to new perspectives frequently as the story unfolds, a switch that is cleverly realized in game when the flashlight is handed off to another potential victim. The Move’s trigger button makes you walk/run (depending on the circumstances) in whichever direction the light is pointing, and the top-mounted Move button is used for interacting with objects in the environment. There’s no gamepad support planned for Until Dawn at this time, but the game isn’t due until 2013 and even Supermassive admits that plans may change. It certainly couldn’t hurt to include gamepad controls as well; not every PS3 owner has a Move but they all have at least one SIXAXIS or DualShock 3. Just saying. Exploration yields information, which in turn helps to up each character’s chances of survival. There’s no in-game indication of this, no meter or percentage rating to inform you of how you’re doing. The world is more immersive than that. You’re examining found clues — using the Move to twist objects around in your hand — and solving puzzles involving lever-pulling and the like. 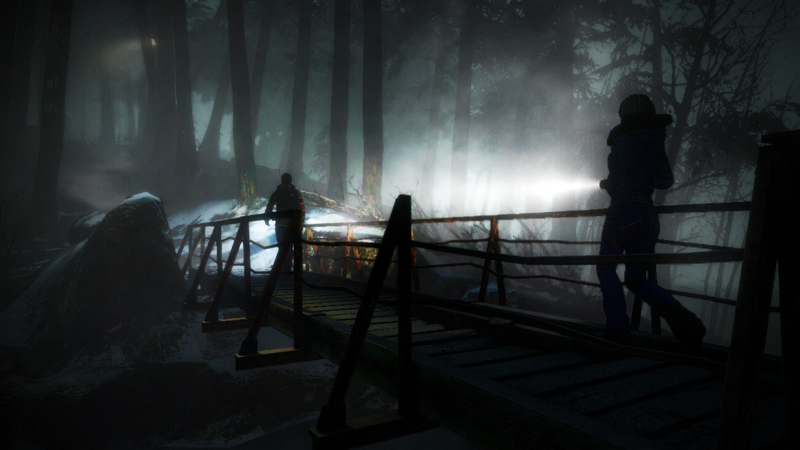 Story is the focus in Until Dawn, but there’s definitely a game to be played here as well. You might haven noticed that I’m shying away from explicit descriptions of what I saw, and that’s very much deliberate. Supermassive is cooking up a solid story here thanks to the writing efforts of Larry Fessenden, an accomplished Hollywood horror/thriller creator and Fangoria hall of famer. The media demo follows two of the eight partygoers after they’re exiled from the festivities and told to “get a room.” The “room” in this case is a log cabin located a good distance away from the ski lodge. The walk amounts to a slow burn, building tension through occasional jump scares and creepy happenings while establishing the two lovebirds as likable, if slightly obnoxious and immature, characters. Things take a dark turn shortly after the two reach the cabin. Clues begin to paint connections between this new trip and the previous year’s trip. There’s also the suggestion that a local abandoned mine was the site of some horrific event. Then things really go bad. I won’t spoil it here, but suffice to say that our two characters are confronted by something unexpected and tense moments ensue. You maybe even see a little bit of blood. Personally, I’m hoping that Supermassive holds off on delivering any more previews prior to Until Dawn‘s 2013 release. The game certainly appears to deliver on its promises and, with that formally confirmed, the less we’re told from here on out, the better.